German aircraft designs were consistently among the most advanced and successful of the war. Of all the nations, Germany was the first to begin to make significant use of jet aircraft, although these nevertheless came too late in the war and in insufficient quantity to have a decisive effect on the course of the air war. The Luftwaffe (German air force) had a few advocates for the production of large four-engine bombers, most notably the prewar chief of staff general Walther Wever. However, with his death in April 1936, the idea of a strategic role for the Luftwaffe also died, and the German air force instead adopted the basic doctrine that bombers should be used tactically to support the ground troops directly by striking targets on or near the battlefield. By the time the war began, German bombers were used strategically to bomb civilian targets, especially London and other English cities during the Battle of Britain. However, because of prevailing Luftwaffe doctrine, Germany, unlike the United States and Great Britain, produced no significant four-engine bombers. Abortive plans were made for the “Amerika” bomber, a spectacular aircraft of intercontinental range, but nothing came of the project. The Stuka. 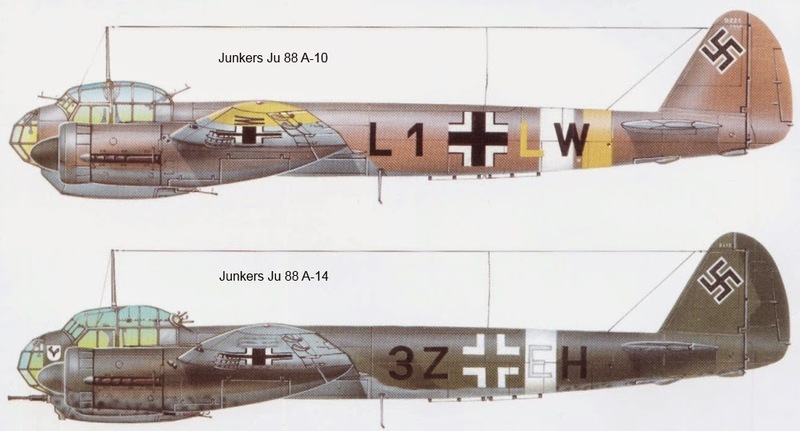 Perhaps the most infamous of Germany’s bombers was the single-engine Junkers Ju87, better known as the Stuka. Designed in the mid-1930s, the Stuka was a dive bomber, which deployed its 1,100-pound bomb load not from level flight but from low altitude, near the end of a sharp 80-degree dive. This ensured surgical accuracy of the strike. By 1942, it was even fitted with a single 4000-pound bomb, which was used against heavy tanks. After striking its target with bombs, the Stuka often circled around to strafe survivors with its three 7.9-mm machine guns. The aircraft was also fitted with sirens, so-called Jericho trumpets, which produced a truly terrifying scream during the high-speed dive. Thus, the weapon produced as much panic and terror as physical destruction. Stukas were deployed with great effect in the invasion of Poland, the Battle of France, and the invasion of the Soviet Union. However, after these early operations, the 238-mile-per-hour, poorly maneuverable Stuka proved increasingly vulnerable to fighter attack and was reconfigured in 1942 as the Ju87G-1, a dedicated antitank aircraft. The Ju87B-2, best known of the Stuka iterations, was powered by a single 1,200-horsepower Jumo 211 Da engine and had a wingspan of 45 feet 3 1/3 inches, a service ceiling of 26,250 feet, and a range of 490 miles. It could be configured to carry a maximum of four individual bombs. About 5,700 Stukas were completed before production ended in 1944. Germany’s other significant bombers were twin-engine medium bombers and included the following. Heinkel He111H-3. Crewed by four or five, the Heinkel first flew in early 1939. It was powered by two Junkers Jumo 211D-2 V-12 engines, each making 1,200 horsepower for a top speed, empty, of 258 miles per hour. Range was 745 miles and service ceiling 25,590 feet. The plane’s wingspan was 74 feet 1 3/4 inches. It was heavily armed with 7.92-mm machine guns in the nose cap, in the dorsal position, in a ventral gondola, in waist windows, in a fixed forward-firing position, in the side of the nose (could be operated by the copilot), and in the tail. The plane also had a 20-mm cannon on a fixed mount in the front part of the ventral gondola. Bomb load was up to 4,410 pounds. Junkers Ju88A-4. A very successful design, 14,676 were built in all versions. About 9,000 were configured as medium bombers. The rest were configured mostly as night fighters. The versatile aircraft was used throughout the war, beginning with operations in Poland in 1939 and against just about every enemy Germany fought. 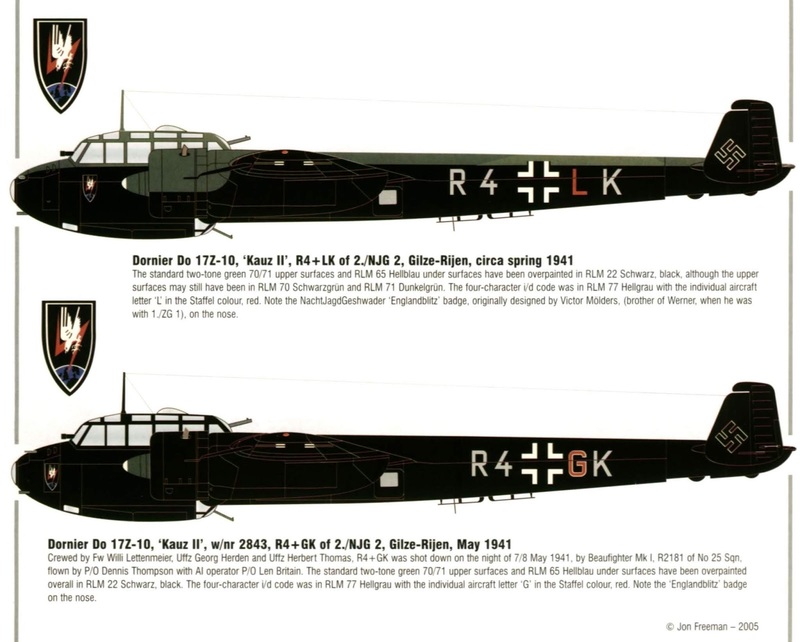 The Ju88A4 version was capable of operating as a level bomber, a dive bomber, and a torpedo bomber. Generally, the bomb load consisted of 10 50-pound bombs loaded internally with as many as four bombs of various types fixed to hard points under the wings. A pair of torpedoes could also be mounted under the wings. Wingspan was 65 feet 10 inches, and the plane was driven by a pair of 950-horsepower Junkers Jumo 211 F engines. Top speed was 292 miles per hour, ceiling 26,900 feet, and range 1,106 miles. Dornier Do 217K/M. The Do 217 series of bombers became operational in March 1941 and represented a significant advance over the Do 17. In addition to serving as a level bomber, the Do 217 could be configured as a night fighter, a torpedo bomber, and a reconnaissance aircraft. By August 1943, the aircraft was also being used to carry anti-shipping missiles, and by September, it was delivering guided bombs against warships. Production reached 1,905 of all types, including some 1,366 level bombers. The Do 217K and M versions were crewed by four and powered by two 1,700-horsepower BMW 810D 14-cylinder radials (K) or two 1,750-horsepower Daimler-Benz DB603A inverted V12s (M). Top speed was 320 miles per hour, service ceiling 24,600 feet, and range 1,430 miles. Wingspan was 62 feet 4 inches, and, for the M version, armament consisted of four 7.92-mm and two 13-mm machine guns with a bomb load of 8,818 pounds; the K version added two underwing FX-1400 Fritz X radio-controlled bombs, two FX-1400 bombs, or two Hs 293 missiles. Junkers Ju188E-1. Produced in reconnaissance (designated D) and bomber versions (designated E), the Ju188 series was crewed by five and first flew in 1940. About 1,100 were produced during the war. The Ju 188E was powered by two BMW 801G- 2 18-cylinder two-row radials, each producing 1,700 horsepower for a top speed of 310 miles per hour. Service ceiling was 31,510 feet, and range was 1,211 miles. Wingspan was 72 feet 2 inches. Typically, the aircraft was armed with a single 20-mm cannon in its nose and three 13-mm machine guns, one in a dorsal turret, one manually aimed from the rear dorsal position, and one manually aimed from the rear ventral position; in some configurations, twin 7.92-mm machine guns were substituted for the last position. Typical bomb load was 6,614 pounds loaded internally, or two 2,200- pound torpedoes under the wings. Heinkel He177A-5. This was the largest bomber Germany actually deployed, with a wingspan of 103 feet 1 3/4 inches and a bomb load capacity of 13,228 pounds. It was powered by two massive 3,100-horsepower Daimler-Benz DB610 coupled engines. This design feature was an innovative attempt to reduce drag, but it created severe reliability problems that often resulted in engine fires. Fully three-quarters of the preproduction prototypes crashed; 1,146 were produced, and while the 3,100-mile range was badly needed by the Luftwaffe, the airplanes were not very effective as strategic bombers. They were used with moderate effectiveness in an antitank role. Top speed was 295 miles per hour and service ceiling 26,500 feet. Armament consisted of one 7.92-mm machine gun manually aimed in the nose, one 20-mm machine gun manually aimed in the forward ventral gondola, two 13-mm machine guns in a front dorsal turret, one in the aft dorsal turret, and one 20-mm cannon in the tail position. 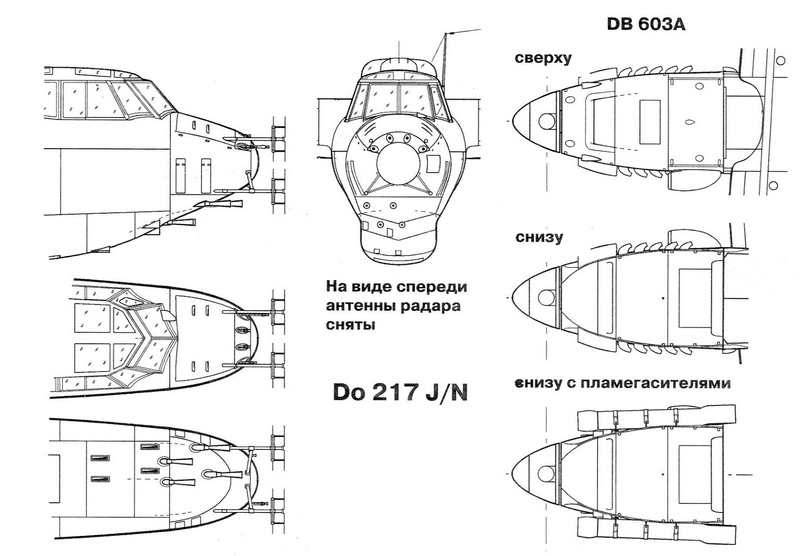 Arado Ar234B-2. Of greater historical than practical significance was the Arado Ar234B-2, the world’s first jet bomber, which became operational at the end of November 1944, too late to have any impact on the course of the war. Powered by a pair of BMW 003A-1 jets, each developing 1,764 pounds of thrust, the Arado had a top speed of 461 miles per hour and could carry 4,409 pounds of bombs over a 1,000-mile range. Service ceiling was 32,810 feet. For defensive purposes, the Arado carried two 20-mm cannon. Only 210 were built. German fighter designs were generally more successful and more innovative than its bomber designs. 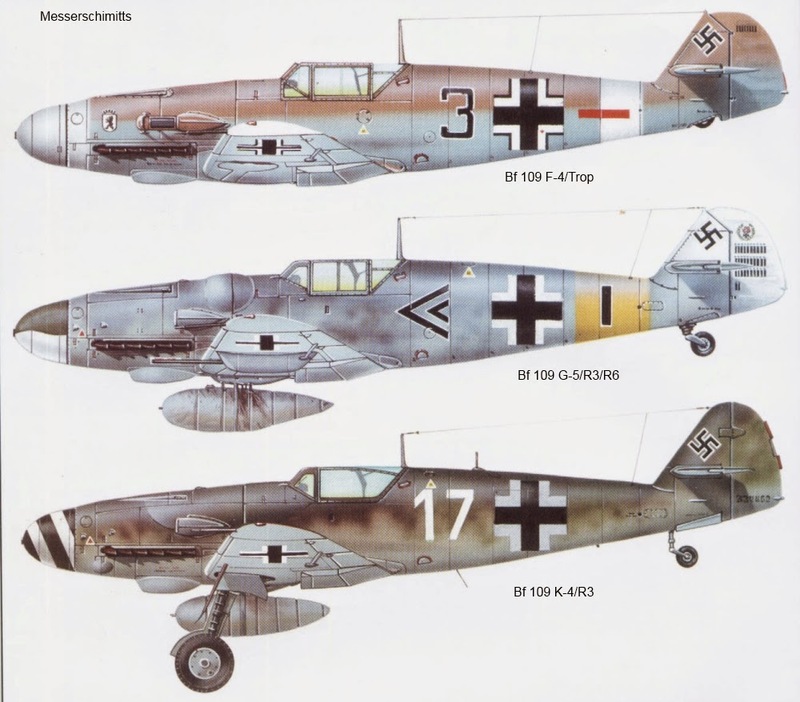 The two most important fighters were the Messerschmitt 109 series and the Focke-Wulf 190 series. Messerschmitt 109. The Messerschmitt 109 first flew in October 1935, powered by British Rolls- Royce Kestrel engines. The aircraft entered Luftwaffe service in spring 1937 and received its baptism of fire in the Spanish civil war. By the beginning of World War II, the aircraft existed in a number of variants, and 1,000 were deployed against Poland in September 1939. The 109 was superior to most other fighters at the outbreak of the war but was fairly evenly matched with the British Spitfire and Hurricane in the Battle of Britain. It did have one very significant advantage over these rivals, however. Its fuel injection system allowed for a constant fuel flow even in negative-g conditions, which meant that a pilot could dive or shear away much more quickly than his opponents. This added significantly to the plane’s survivability. Counterbalancing this advantage, however, was the 109’s limited range—a 300-mile operating radius for the 109G. This gave the fighter precious little combat time over relatively remote targets such as those in England. Some 109 variants had a cannon placed in the hollowed-out nose cap. In early models, this created an unacceptable level of vibration, which, however, was eliminated in later versions. Additionally, most of the fighters were fitted with two wing-mounted cannons and two machine guns mounted on the top of the nose cone that were synchronized to fire through the propeller arc. The 109G, introduced in 1942, was powered by a Daimler- Benz DB605 1,475-horsepower engine to a top speed of 387 miles per hour at 23,000 feet. Wingspan was 32 feet 6 1/2 inches. The backbone of the Luftwaffe, some 30,000 109s were built before the end of the war. Focke-Wulf Fw 190. Superior even to the formidable Messerschmitt 109 was the Focke-Wulf Fw 190, which made its first flight on June 1, 1939. It first saw action in the Battle of France in September 1941 and was markedly superior to the British Spitfire. Most Fw 190s were the A series, powered by a single BMW 801 2,100-horsepower radial engine. However, late in 1943, the D was deployed against U.S. bombers, powered by the Jumo 213 inline, liquid-cooled engine, which developed only 1,770 horsepower but had improved performance, producing a top speed of 426 miles per hour, 18 miles per hour faster than the A version. In all, some 20,000 Fw 190s of all types were built before the end of the war. Wingspan of the D type was 34 feet 5 1/3 inches, and armament consisted of two 20-mm wing-mounted cannon and two 13-mm machine guns in the nose. Range was 520 miles and service ceiling 40,000 feet. Messerschmitt Bf 110. The twin-engine Messerschmitt Bf 110 made its first flight in May 1936. With all-metal construction and a crew of three, the aircraft was powered by two Daimler Benz DB 601 engines, each making 1,100 horsepower and propelling the plane to a maximum speed of 336 miles per hour over a range of 680 miles. Wingspan was 53 feet 4 inches, and armament consisted of five machine guns and two 20-mm cannon. Formidable as all this seems, the aircraft performed poorly in the Battle of Britain. This prompted a redesign with the inclusion of radar, which transformed the Bf 110 into the Luftwaffe’s finest night fighter. In all, nearly 6,000 Bf 110s were produced before the end of the war. Jet and rocket-propelled fighters. Late in the war, in 1944, Germany introduced both jet- and rocket-propelled fighters. The Messerschmitt 163B was powered by a single Walter rocket motor developing 3,700 pounds of thrust and capable of reaching 590 miles per hour at 20,000 feet. Range, however, was extremely limited. Armed with two 30-mm cannon and 24 R4M rockets, the 163B had a wingspan of 30 feet 7 inches. Very few were produced. More significant, however, was the jet-powered Messerschmitt 262A, with two Junkers 004 jets, each making 1,980 pounds of thrust, mounted under the wings. Top speed was 540 miles per hour over a range of 420 miles. Armament was limited to four 30-mm cannon. The aircraft was designed primarily to attack Allied bombers, which it did very effectively. Had the aircraft been introduced earlier and in much greater numbers, its impact on the air war over Europe would have been profound. Further reading: Brown, Eric. Wings of the Luftwaffe: Flying German Aircraft of the Second World War. Shrewsbury, U.K.: Airlife, 2001; Donald, David, ed. 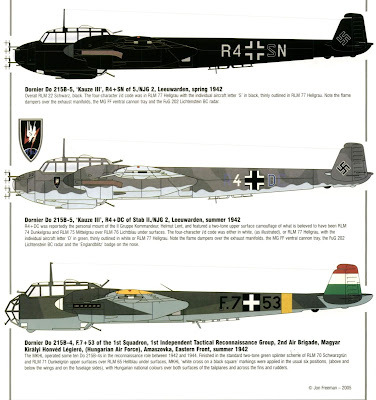 German Aircraft of World War II. Minneapolis: Motorbooks International, 1996; Griehl, Manfred. German Jets of World War II. London: Arms & Armour, 1989; Gunston, Bill. An Illustrated Guide to German, Italian and Japanese Fighters of World War II: Major Fighters and Attack Aircraft of the Axis Powers. London: Salamander Books, 1980; Gunston, Bill. World War II German Aircraft. London: Book Sales, 1985; Kay, Antony L., and J. R. Smith. German Aircraft of the Second World War. Annapolis, Md. : United States Naval Institute, 2002; Shepherd, Christopher. 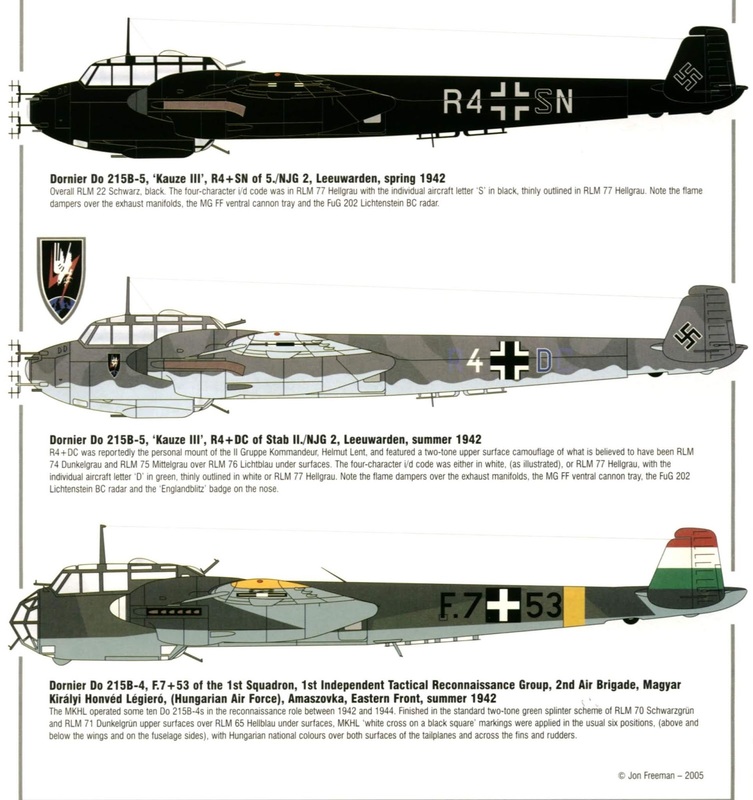 German Aircraft of World War II. London: Sidgwick & Jackson, 1975. Often over looked during the Battle of Britain is the valiant attempts by the British RAF Bomber Command to counter the German Luftwaffe bombing with its own raids. Suffering as heavily as the Germans, they switched to nighttime bombing as a way to avoid fighters. Indeed, it was an accidental night bombing raid by the RAF bombers that saved England from defeat! The Luftwaffe needed something to stop RAF bombers at night. They chose the Bf-109D, Me-110C, and Do-17Z's. This choice is a strong affirmation of the 17's potential as a nimble and fast fighter (passing over the Ju-88C for some reason), creating arguably the first custom built (rather then simple modification) night fighter! These 'bombers' now became the test beds and foundation for all future night fighter designs; anything used by "Nachtjäger" squadrons was first tested on a 17Z or 215B-5. The first 17Z-6 "Kazu" (Screech Owl) conversions ironically used an Ju-88c nose section, but was this was awkward and quickly changed to an original design, and renamed the 17Z-7. There is a report of a Do-17P also being pressed into this roll. Still not satisfied with the performance, a new design built from experience with the early prototypes was created, resulting in the successful 17Z-10 "Kazu II". These were stripped of all excess weight and all but one defensive MG15, and then armed with 4x MG17 7.92mm machine guns and 2x MG/FF 20mm cannons and a first of its kind "Spanner-Anlage" Infrared searchlight and Detector (modern day FLIR). The first 2 night fighter kills made by the new "Nachtjäger" force are credited to Do-17Z's shooting down 2 Wellingtons on 23 July 1940 (the day after NJG1's official creation). After perfecting the designs with the 17Z's, the Luftwaffe then modified at least 20 of the faster 215's toward the end of 1940 (it is believed). Airborne radar was not available until mid-1941, so the first non-radar equipped 215B-5 "Kazu III" could top 500kph (310mph), faster then most Ju-88's! The leading night ace who flew 17's and 215's during this time was nicknamed "Dr. Night"; Ludwig Becker tallied 46 kills before he himself was shot down (in a ill planned daylight attack using Bf-110). A 17Z-10 "Kazu II" was also used in developing airborne radar and the "Schrage Music" weapon system which was soon installed in 215B-5's, but that reduced its top speed to around 485kph. The Do-17/215-night fighters served nearly two years before replaced by other aircraft types (Me-110, Ju-88c, Do-217, He-219). 17Z-6 = questionable if it was a night fighter, but whatever its use it was converted from a Z-3. 17Z-7 = Kauz I' 1 or 2 converted from Z-2. 17Z-10 = Kauz II' about 9 converted from Z-2; at least one had radar, possibly a Schrage Music testbed! 215B-5 = Kauz III' 20 converted from B-1 and B-4's; radar installed sometime later. "Kauz" means "screech owl" in English. The first 2 kills claimed by the Luftwaffe's newly formed Night Fighter squadron (NJG1) was made by Do-17Z-10's over a pair of Wellingtons. 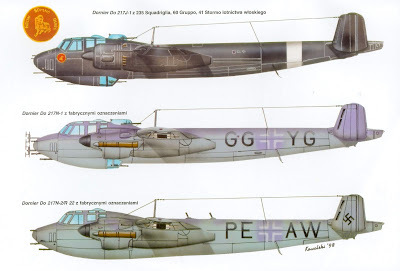 It is important to note that NGJ1 did have Ju-88c's at their disposal, as well as Bf-109 and Bf-110's, so it is intriguing that the Do-17 was chosen as the lead platform for developing nightfighting hardware and tactics. 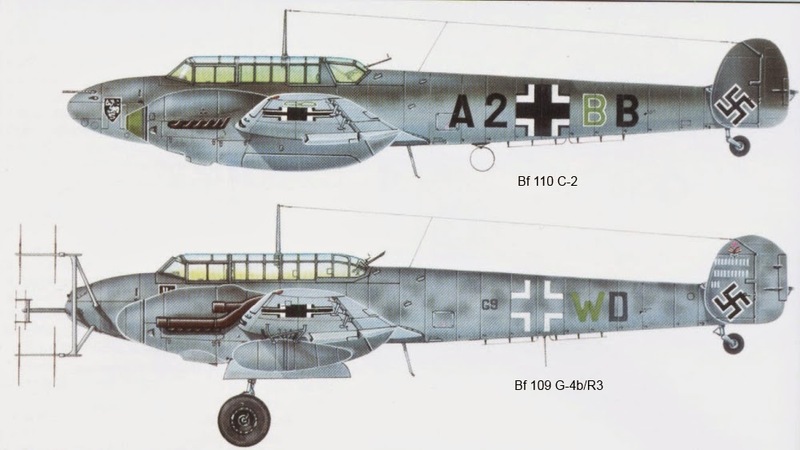 Over time NJG1 continued to convert more Do-17's and then Do-215's, despite the fact its Ju-88c could have just have easily been chosen instead. In the latter half of 1940, the RAF's night bombing was making a mark so it was a priority project to counter this nuisance (note the accidental bombing of Berlin and Hitler's reaction), thus it is reasonable to assume they would use the best equipment to counter it, not "obsolete and surplus" Do-17's, a very interesting and telling fact on the performance of the type! The first version, the 17Z-6, used the nose of a Ju-88c, but this marriage was not ideal, so a new nose was made, but used the same weapons. 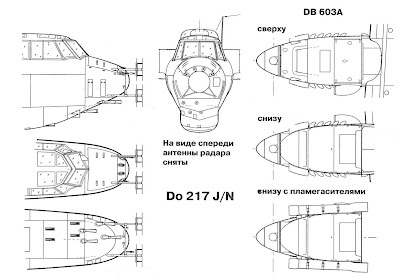 The 17Z-7 was not satisfactory either, so an entirely new nose was made, with nearly double the armament of the 88c, the 17Z-10, and that was the arrangement used in all future versions. A logical conclusion is that the 17 was far from out classed in 1940, and could still provide good service. Fitted with the early FuG 202 Lichtenstein airborne radar and a Spanner infra-red searchlight, the third conversion was a Do 215B-5, named Kauz III. This was in use until mid-1942 when the larger, more powerful Do 217J-1 arrived with 4./NJG 1. The prototype of this fighter conversion of the Do 217E-2 bomber few in late-1941 and with a formidable armament of four 20mm and four 7.9mm guns, great hope rested on its arrival in service. Hope turned to despair when the crews experienced the type's poor maneuverability, insufficient power from the BMW 801 engines and that old problem which plagued a number of German designs, a weak undercarriage. While Ju 88s and Bf 110s made up the bulk of the night-fighter force, Dornier persevered and with the J-1s relegated to training it delivered the Lichtenstein radar-equipped Do 217J-2 for service from early-1943. This proved marginally better but it was still too heavy and with the radar antenna cutting the speed down to less than an RAF Halifax bomber, it had limited success. Another attempt was made with the Do 217N-1 which few on July 31, 1942. Re-engined with 1,750hp Daimler-Benz DB 603As it entered service late that year and showed much-improved performance. Additional to the nose armament, some aircraft received upward-firing cannon in the centre fuselage which allowed the German pilots to fly under the bomber and attack its unprotected belly, an arrangement also adopted for use in Bf 110s and Ju 88s. With the new weaponry the Do 217N-2 entered service in spring 1943 but lasted less than a year before withdrawal from use. Production of all versions totalled 364.